Looking for the perfect Sydney wedding venue is sometimes challenging because so many of them offer luxurious surroundings and book up fast. While many of them try to outdo one another in palatial decor, a Sydney Harbour Wedding at Taronga Centre is a little more down to earth. In fact, you can say that literally since it’s next to the world-renowned Taronga Zoo. 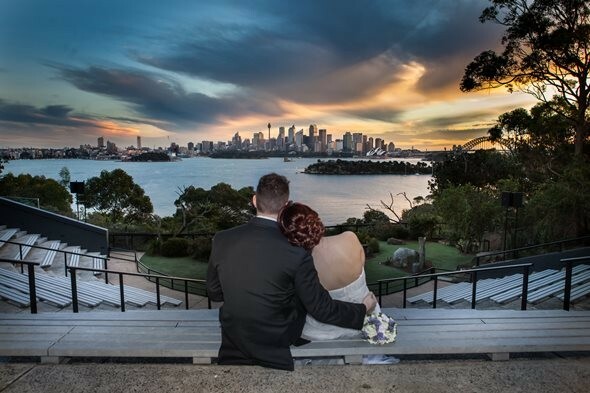 As a Sydney Harbour venue, Taronga Centre is the best place for brides and grooms who love animals. At the same time, the centre provides intimate venues for some of the best views of the harbour in the immediate area. Thanks to the slightly smaller ballroom and courts, you’ll inspire a better experience in the wedding entertainment you hire. Those of us at Lily Road can bring this to you within Taronga Centre’s inviting atmosphere. Here you have the main and most popular venue at Taronga Centre where you’ll find corporate events and weddings on a daily basis. It’s popular because of the harbour views, of course, though also popular because you’re surrounded by animals in the nearby zoo. Those of you who love wildlife will find a lot to love here, even if there’s enough distance where you won’t intrude on their space (or vice versa). Taronga notes when you book the Harbourview Garden Court, you’re helping to support animal care and conservation. While this gives more meaning to your wedding, you have a lot of other great amenities within the court itself. You’re surrounded by a private courtyard here, giving you more privacy than in other Sydney wedding venues. The gardens around the area are also very beautiful, giving nature lovers a comfortable place. However, you’re also given a lot of venue technology. You’ll have roller blinds to protect you from unexpected torrential rains. Plus, you get automated lighting to set just the right mood. Combine this with their state-of-the-art audio/visual system, and you have the perfect environment for the wedding band you hire. Those of us at Lily Road Band love playing venues like this because it allows us to sing more personally to guests. Nevertheless, we know what works best for any type of venue. As an alternative to the Harbourview Court, you might want to try the bird show ampitheatre. This often books fast, so you’ll want to call a long time ahead. Thanks to the ampitheatre space, you get a panoramic view of the harbour, plus helping guests see your wedding ceremony without obstructions. During summers, it’s ideal, but you do need approval from the Taronga Zoo for official use. Again, those of you who love wildlife can capture some of it in your wedding photography throughout the area. Being an ampitheatre, it allows your sydney wedding band to work a larger crowd. We can do this for you in settings just like this. To accommodate larger guest lists, try the Harbourview Terrace, offering 180-degree harbour views. With a private balcony, bar, room partitions, and internal sound system, entertaining here is just as impressive. The same goes with the ballroom, which is equally spectacular. Capable of holding larger crowds and possessing a sweeping entrance, you’ll love holding your wedding reception here. Private areas allow your wedding entertainers to work on a more intimate level once again. Don’t forget about The View Restaurant nearby. Usually open to zoo guests by day, you can reserve this space in the evenings for your wedding reception. Wedding singers have a perfect venue here to make the songs played resonate more personally. At Lily Road, we’ll help you find the perfect wedding singers for the venue you choose. Our band is there to provide the best and most meaningful wedding entertainment you’ll find in Sydney or Melbourne.